Hello Odette, I am having a problem. Well, i am 13 years old and did a little ballet as a toddler. As a little kid, i soon lost interest. However, now, i have no other wish then to become a professional ballerina. I believe i am a little bit too old, but i want this more than anything i have ever wanted in my entire life. The biggest problem is, my parents will not enroll me in classes. They don't think i want this enough and my time is trickling away. I believe i will regret it for the rest of my life if i don't start soon. How should i convince my parents? Please help me! Thank you for contacting me, it is always great to hear from you even when you are in need of desperate help! Well, the support of your family is one of the most important parts in becoming a dancer. You need so much help through the process, it is financially expensive and also you need the people close to you to be there for you through all the tougher times. Try sitting down and explaining to your parents your determination to become a dancer and tell them how you really feel. Every dancer has to start somewhere, so even if it is just classes a few times a week to get you started you can then see where it leads to. I must tell you though, it is very hard to become a professional dancer and you must be totally committed with the best teachers and training you can find. started again at aged 8. I took ballet more seriously when I was 11 and joined a vocational dance school where I trained and lived away from home for seven years. Although my parents never had lots of money, I managed to get scholarships to support me financially and I see now how much my family gave me the support I needed. My mum visited me on weekends, my dad talked on the phone to me for hours and I had all their full support which is really important. Throughout my time at a vocational ballet school, there were many talented dancers joining at all different ages and even as late as 16. The dancer's that joined in later were studying at their local dance school and took the decision to take it even more seriously at a proper training school. Anything is possible in the life as a dancer, but you need many factors to help pursue a dream to become a professional. You need training, talent, hard work, teachers and the crucial support of your family. Whatever happens, even if you dedicate yourself to dance you must also stay committed to your school work too. I do not blame your parents for not being so eager for you to become a professional dancer, as it is an industry that many people feel is more unpredictable. However, there is no harm in letting you try ballet classes so you can enjoy the fulfillment and know that you did your best to become a great dancer whether professional or just as a hobby. Have a think and let me know if you need any more help. Hi Laura, your story is very similar to mine! I started ballet at 12 and I'm 14 now, being a late starter is hard but soon you'll feel just as good as the other girls, with the right teacher. Just tell your parents how much you adore ballet and how serious you are about it, and if its expensive maybe offer to pay a little towards classes? Hopefully then you'll get the okay from your parents and be welcomed into the exciting world of ballet! P.s could you have a look at my too, it's called 'ballet pointe shoes- can I start?' Thank you. Hi Girls! Both, Olivia and Laurie. Thank you both so much for your generous comments. It is so touching to see you help each other out and share your own situations. Olivia, you give wonderful advice that I admire myself. Laurie, I am fascinated by your story and thank you for getting in touch with me. I love to hear your passion for ballet. Remember, every dancer goes through their ups and downs despite how much you love ballet. There will be times when you feel like giving up, or feel affected by other people even though they don't really matter to you. What you need to remember is to focus on yourself. There will always be people through your life who will come and go, so never make a choice because of somebody else. You must learn to follow your instincts and trust yourself. Throughout my time as a young dancer, I sometimes got so affected by the other girls in my class or tried to make choices that would look good or sound impressive. However, you actually start to to doubt yourself and forget what you really want if you keep caring so much of what other people think. If you have a passion for ballet then you have to follow it no matter what. Trust the people that care for you and who will always be with you, like your closest famile and friends. If you start to worry about the other girls in your class then you are wasting your own precious energy. They will move on and out of your life, which is why you always have to stay focused on what you want. I am always saying to believe in yourself, because that is how you can stick to something and know it is right for you. If you feel good about yourself, then everything good will come to you. Keep reading my website and keep in touch. 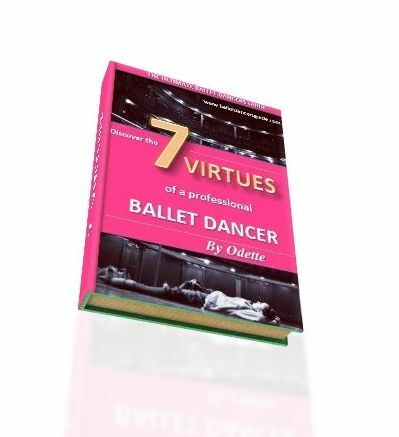 You can subscrible to my mailouts which I deliver to you once and week to give all the advice for young dancers like you. My name is leena, I am 12 years old, and i want to become a professional dancer. I have talked to my mom and she feels like it would be a waste of their time and money if i decided to pursue dance as a career. My dad, on the other hand, understands how much dance means to me, and is willing to support me in whatever career i choose to pursue. I don't really feel that confident in telling my mom because i know how she is going to react immediately, i think i will talk to my dad first because he understands how i feel about dancing. The dance studio is my second home, my dream is to move away from home and live at a full time dance school and have strict training to become a ballerina. I have to tell my parents soon, because my mom will be less upset with me if i tell her sooner so she doesn't have to waste anymore money on books...all that stuff. Anyone plz comment this means a lot to me, Thank you so much........ this really is the love of my life, and if i have to, i will prove them wrong and fight for this. THANKS EVERYONE I APPRECIATE IT ALLLLLLLL. hi i am doing ballet but i am just not flexible enough, i mean there are people out there who are ypunger than me but they are still more flexible! my mom says that i am not flexible enough and i get embarrassed cuz mom says like as if there's nobody around!i seriously need some help not with my mom but i guees i'd just like some tips on becoming more flexible. I love ballet. However, my parents just don’t believe that it’s a career that will be able to support me and earn me money... I don’t care about money thought!!! I just want to Dance even if it means I’m not rich and live in a small apartment!! Also. My mom thinks that ballet is just a hobby, for me it’s NOT! Ballet is a passion, an addiction, a sometime obsession, a lifestyle, a dysipline, an art... it is NOT... NOT a hobby, she just can’t see my perspective! Please respond quickly! My name is stella. I am turning 12 in march and inreally want to do ballet. I love to dance and did dancing for about 5 years. As i grew up i started to understand dancing. I relized the different styles and moves. Two weeks ago I was going to tell my mum that i wanted to do ballet but before i could she said that she signed me up for hip hop classes and that we start the next day. I want to tell her what I really want to do but im afraid that she might freak out because I always change my mind( I went from dancing to football). So i need some advice to what I should do.